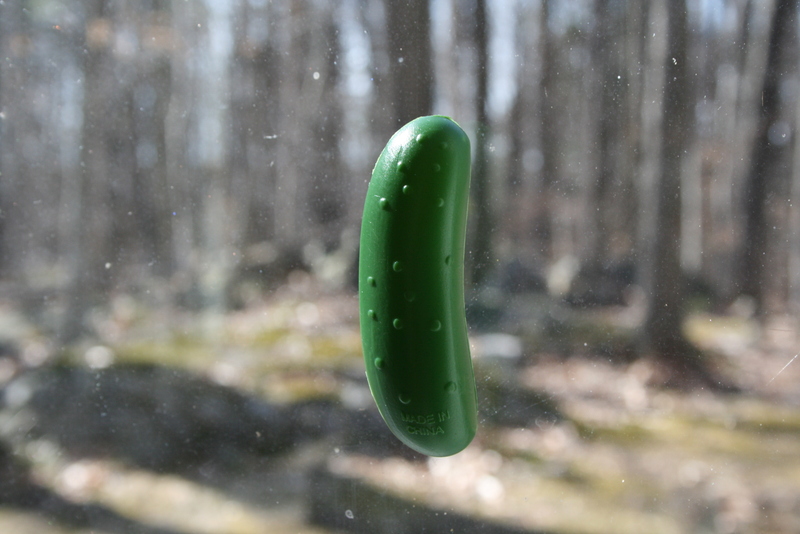 A brief clarification on the last post: The Pickle Patch is still here, and I’ll continue to provide regular updates on our family’s life in Vermont. On The Willows is an entirely different blog, created by a friend of a friend for women to share their life lessons, to which I will contribute from time to time. My posts there will likely be a little different than the ones here: less day-to-day, more personal, fewer pictures of the kids. But I’ll provide the link when I do post over there, on the off chance that you’re not getting enough information here! Okay, back to our regularly scheduled program…. Just as I am not a born cook, I am not by nature a crafty person. On the basis of once having taught elementary school (which should require a minor in bulletin board design) and having received a graduate degree in studio art, I could perhaps pass for creative. But I’ve never been able to sustain any interest in things like scrapbooking, knitting, or jewelry making. I do, however, have more desire to be a crafty person than I do to be a great cook, if only because the results can be enjoyed a little longer. 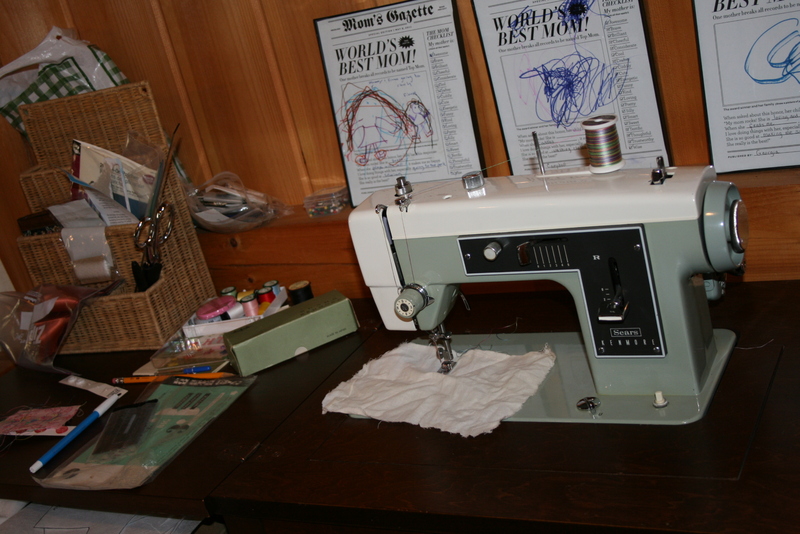 So, when we moved to Vermont and my mom offered to bring up her old sewing machine, I jumped at the chance. 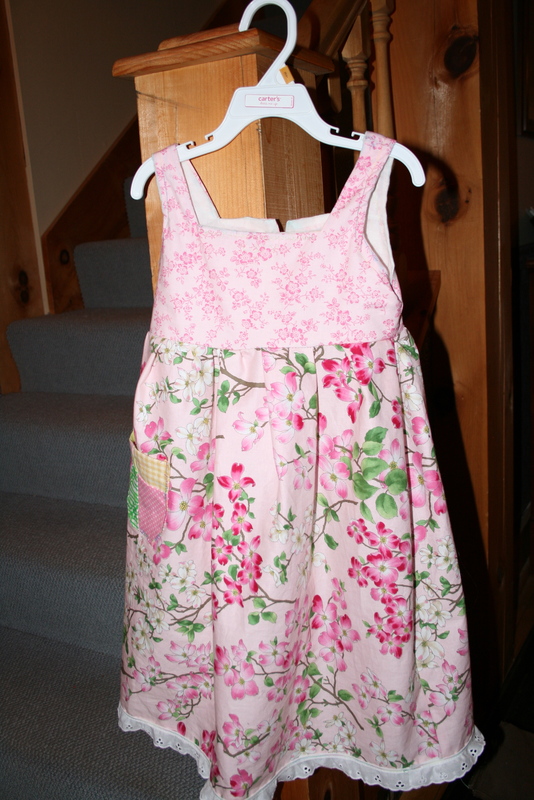 Mind you, I haven’t sewn anything since I made a cupcake pillow in junior high Home Economics, but I envisioned snowy evenings hunched happily over the sewing machine, turning out cute little dresses for the girls. And guess what? This is a happy story, not “I Love Lucy” meets a sewing machine. The only part of that vision that didn’t materialize so much this year was the snow. It’s a great book if you’re looking to sew something for a little girl and don’t know what you’re doing. 1. She had a birthday back in November, and I figured it would be more meaningful to make her a dress than buy her something. So I had her pick out a design in the book above, and we went to the fabric store and she picked out the fabric. 2. Fiona loves clothes, and has a very particular sense of style. Given that Erick has been known to wear clothes until they actually fall off of his body, and I gave up caring about what I wore four years ago (when it became clear that no matter what I put on in the morning, it would look like a used napkin by the evening), this is clearly an inborn trait of Fiona’s. She loves to choose her outfit for the day…and then change it…and change it again. I have actually had to make her “Clothing Change Tickets” that limit her to two clothing changes a day, or I’d never get her to leave her closet. That could reasonably pass as a dress, right? Success! And it was FUN. I’m using the leftover fabric to make one for Campbell now. Fiona modeling her new dress. 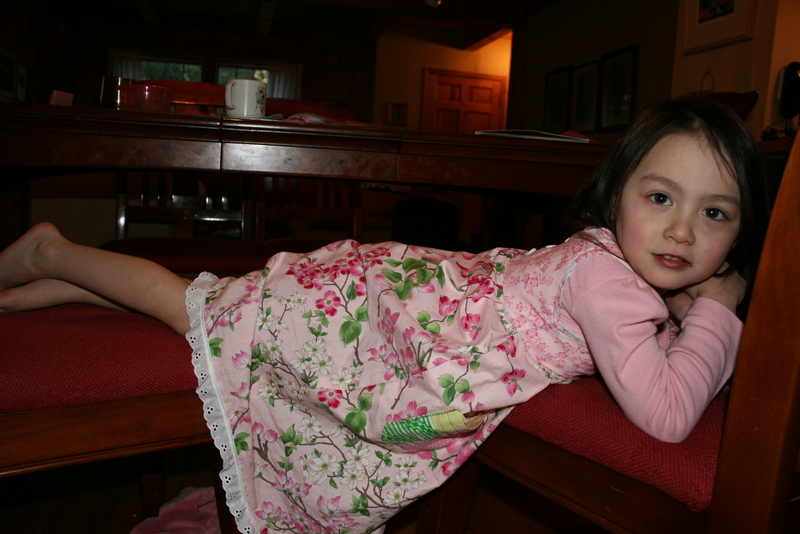 (YES, this is the pose she hit when I said, "Fiona, let me take a picture of you in your new dress." I have no idea whose child she really is).